Home news Where Is Patience Jonathan? 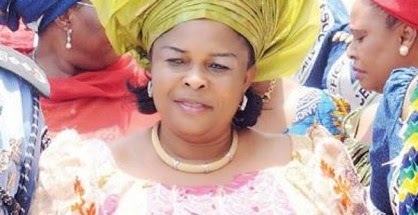 The wife of the President, Mrs. Patience Jonathan, has not been seen in public since President Goodluck Jonathan lost the March 28 presidential election to Maj. Gen. Muhammadu Buhari (retd.) of the All Progressives Congress. The President conceded defeat and called Buhari on the telephone when it became clear from the results released by the Independent National Electoral Commission that he had lost his re-election bid. Some dignitaries including serving and former government officials had visited Jonathan to commend him for conceding defeat and solidarise with him on his loss. One of the visitors had told Punch correspondent that Mrs. Jonathan also received visitors inside the President’s official residence same day. But since then, the President’s wife had not been seen in public. She did not attend the Good Friday service held inside the Aso Villa Chapel with her husband neither did she attend the Easter Sunday service inside the same chapel. Mrs. Jonathan and the President’s mother, Eunice, had always been accompanying Jonathan to such services. The last time she was seen in public was penultimate Saturday when she and her husband voted at their polling unit in Otuoke, Bayelsa State. While many believed however that she must have been too devastated by her husband’s electoral loss to appear in public so soon, Punch’s investigation however showed that Mrs. Jonathan might have travelled out of the country. A Presidency source who pleaded anonymity told Punch that Mrs. Jonathan travelled to the United Kingdom during the week to sort out some domestic issues. “She is in UK. She may use the opportunity of the trip to visit her children,” the source said. Mrs. Jonathan’s spokesman, Mr. Ayo Adewuyi, did not pick the calls made to his mobile telephone line on Monday. Adewuyi did not also reply a text message sent to him on the mater. It will be recalled that Mrs. Jonathan had during one of the presidential rallies she organised ahead of the elections claimed that Buhari would send her to jail if he was elected.